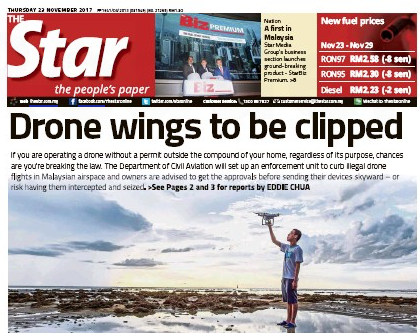 Did you see these articles in The Star yesterday on drones and drone permits? We’re glad that the mainstream media is raising public awareness of drone regulations, but this should not be news to drone pilots. All drone pilots should take an active interest in their country’s legal and regulatory frameworks for drone flights. What can we learn from this? We believe there are three key lessons here. This is very important: Engage your regulators and don’t run away from them! If you’re doing any aerial work, you can start by contacting Encik Abu Bakar bin Ali, and he will be able to advise you on next steps. This information (updated as it’s published by DCA) is easily accessed in Garuda Plex‘s Deployment module. After creating a deployment and selecting your pilots/equipment/schedule, click on “Apply for Permit”, select Malaysia, and you’ll see the full checklist of items to prepare before you contact DCA. I hate to say this, but young sales personnel are currently the biggest source of misinformation in the industry. Many are just there to sell you a drone and thus focus on hardware specs. Most have no direct knowledge of what drone flying entails, and some might quote permissive rules from a random country. We’ve even encountered drone sellers who tell you that it’s ok to fly around an airport if you don’t get caught! Join the drone pilot community, either in your local area or online via one of the many Facebook groups. Don’t be shy when asking questions, because most drone pilots are friendly and willing to help you out. Garuda Plex makes it easy to see where you can fly. Our free tool at https://plex.garuda.io/map lets you search for a location and turn on Area Limits to visualize no fly zones. We work with our data partner Airmap to keep this updated, and are working hard to get more accurate data on Malaysia’s no fly zone landscape, especially in relation to this latest announcement. Why should you go to school to learn to fly a drone? Many of the advanced drones you can buy today are packed with automation features (GPS position hold, etc), so it may seem like you don’t need any expertise to fly them. It’s all about safety. As graduates of our 5-day Professional Multirotor Pilot Course will tell you, developing a safety mindset and being aware of how to deal with things that come up while flying in shared public airspace takes time and training. You may be able to drive a go-kart on a closed course with no training, but that in no way prepares you to drive a real car on a shared public road. Just as there are tremendous benefits from using drones, there are also real consequences to irresponsible flying. Our Academy is currently active in Singapore, but we will be launching courses in Malaysia soon! When you attend a drone academy course, don’t just memorise the lessons. Always ask yourself (and the instructors) the critical question: Why? Why are there so many rules about what you can or cannot do in the sky with your own drone? Why are there still different interpretations of certain rules? As the proficiency and qualification bars for drone pilots are gradually raised, the demand for trained, certified and law-abiding pilots will likewise increase. That’s a good thing for pilots who have put in the work to demonstrate their professionalism. It’s also a good thing for the public, who can feel safer when they see a drone in the air. Like our Facebook page and chat with us! We’re always happy to help!